Selling your old Huawei phone to buy a brand new Android smartphone? That's really an exciting news but first you will have to wipe out your old Huawei phone to reduce the risk of getting your personal data and identification falling in the wrong hands. 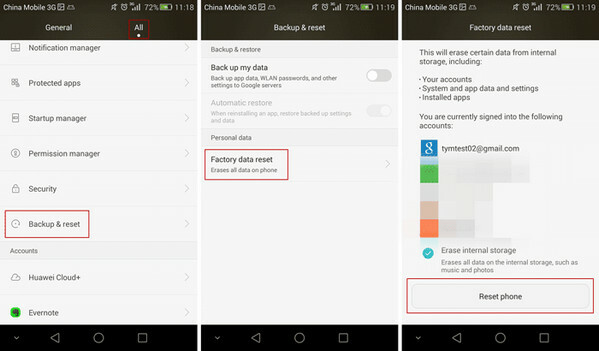 Remember, no in-built deletion functions offered Huawei or any Android phone cannot destroy the data and files permanently from your smartphone. With the proper usage of recovery tools, all the deleted items can be recovered easily. But in this tutorial, we will show couple methods that you can use to erase all data from Huawei phone for both personal and selling purpose. Backup all the data including messages and contacts. Eject SIM card and micro SD card from your phone if there's any. Sign out from every single online email accounts and social networking websites. Keep the IMEI and serial number of your phone with you for a record. The easiest way to wipe out your Huawei phone is to delete all data from Recovery Mode. Recovery Mode on Android phone is usually used for performing system level tasks when your phone is not working properly. But you can wipe data or factory reset your phone from Recovery mode as well, which refers to hard reset. Step 1: Restart your Huawei phone by pressing "Power + Volume Down + Home" buttons simultaneously. Step 2: Keep pressing the home button when the light appears on the phone and release the Power and Volume buttons. Step 3: Your phone should enter into recovery mode now. Use the volume up and down buttons to browse through the option and hit the Home button to select any option. Step 4: Choose "Wipe data/factory reset"and press Home to perform a factory reset on your phone. It may take few minutes to erase all data from your phone but once the process is done, your phone will be restarted and it should be fresh as new now. One of the biggest problems with this method is that the deleted files can be recovered via professional programs like Androidphone Android Recovery. Below is a screenshot of photos being recovered by the program after factory reset. So if you really cared about the data, you should follow the tips in Method 2 to permanently delete the file from the phone. This part is especially valid for people who is trying to sell their Android phones and want to destroy all data from their phone permanently. Deleting files from your phone permanently is important if you have confidential and private stuff loaded on your phone such as official documents, medical records, personal pictures and confidential notes that you don't want anyone else to see. In addition, if these documents or data can be misused if fallen in wrong hands then erasing them permanently should be your #1 priority. Unfortunately, there's no way to permanently delete data on your Huawei phone using default features provided in it. But you can of course accomplish this task by using a professional Android data erasing desktop software. Androidphonesoft Android Data Eraser is a professional and compelling desktop data erasing program that can erase all data from your Huawei phone that cannot be recovered at any cost. It is guaranteed that there's no way to restore any item from your phone if they are deleted with Mobile Privacy Eraser. It uses very powerful and strong algorithms to permanently destroy each and every data from your phone that are generally used by FBI and US government. Your safety and privacy are always on highest concern and that's why this tool will allow you to preview data before you erase them forever. Please first turn on USB debugging on Huawei smartphone. If you didn't know how to handle it, please follow the steps in the following screenshot. After that, connect the phone to computer via USB cable. A few seconds later, there is a pop-up messages on the phone, just type "OK" to continue. After that, the phone should be detected by the program and you can proceed to the next step. Click "Erase All Data" from the top menu bar and click "Erase" button to start the scanning process. This will take a few minutes, please be patient. Later, you need to input "Erase" to the box in order to confirm the operation because it will delete all data permanently from the device. After confirmation, click "Erase Now" button to start the data wiping process. When the erasing process is finished, the phone will reboot automatically. This clears up all the tmp and junk files from the memory as well as the internal storage. The final step is to soft reset the device to make sure no data recovery software could get a single piece of information from the device. 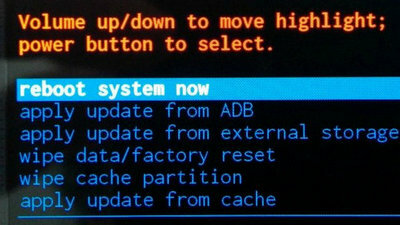 The reset option is usually located at: Settings -> Backup & reset. In this guide, we have shown two fabulous ways to erase everything from your Android phone. Factory resetting is a great way to make your phone clean and faster than ever but one should only use it for personal purpose. If you are selling your Huawei phone to any unknown stranger then you must destroy every single data with a professional data erasing tool like Mobile Privacy eraser and make the process permanent. Although, we have shown how to erase all data from your Huawei phone but you can use the same tool to erase data from any other Android smartphone brand such as Sony, Samsung, Nexus, Motorola, Google and so on.